Today, Sony announced that they would be shutting down their Liverpool Studio, best known to PlayStation gamers for their iconic WipEout series. But the history of the studio dates back to the early days of the games industry, and had a profound effect on the shaping of the UK development scene. The birth of Psygnosis (the studio that would become Sony Liverpool) began with the death of Imagine Software. Imagine began in 1982 and quickly established a name for itself with high budget advertising and packaging, something that differentiated it from other UK games. But while titles like Arcadia were very successful, things quickly turned for the worse after it was revealed in late 1983 that over £50,000 of advertising bills had not been paid. In 1984, Imagine sold the rights to its games to Beau Jolly to raise some capital, but it wasn’t enough. The publisher of Personal Computer Games magazine took the studio to court over £10,000 in unpaid ad placements, but by this time Imagine was hundreds of thousands of pounds in the red. While it took until 1989 for the developer to fully go under, key members of the team left to start anew. One of Imagine’s founders David Lawson and their financial director Ian Hetherington set up a new company called Finchspeed and took two unfinished games from Imagine (Bandersnatch and Psyclapse) and mixed them into one titled Brataccas. They then formed Psygnosis to publish the game. Brataccas received mixed reviews, with many praising its great graphics, and unusually strong plot and setting, but growing exasperated at the needlessly difficult controls. Notably, the cover art was drawn by esteemed fantasy artist Roger Dean, who would go on to draw the art for numerous other titles from the studio. Dean also designed the iconic owl that would adorn all their games as the studio logo. 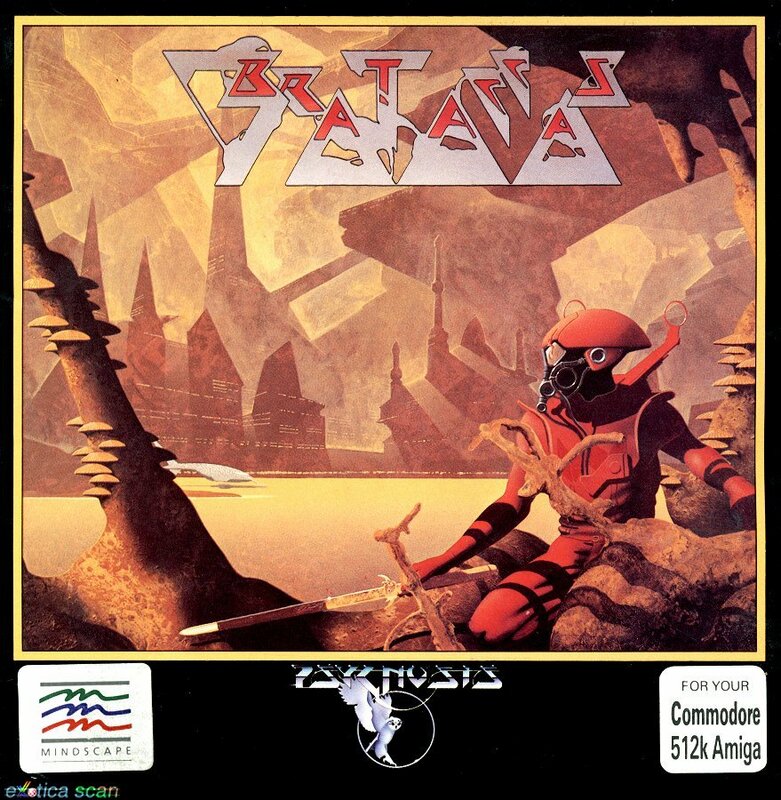 After several successful releases, such as Deep Space, which were all similarly lauded for graphics and scope, but criticized for poor controls, Psygnosis turned to game publishing. In the early days, Psygnosis offered their in house artists to the third party developers (who were often one or two man teams), giving them a reason to choose Psygnosis as a publisher, while keeping the brand image of a high art quality studio alive. With 1987 and 1988 hits Barbarian and Obliterator becoming renowned for their high quality intro scenes, Psygnosis began to invest heavily in improving the sophistication level of their intros, using 2D hand drawn sequences and then FMV and 3D rendered movies created with Sculpt 4D. They even bought Silicon Graphics workstations simply to make these animations. Developed by Reflections Interactive (now best known for Driver) and published by Psygnosis in 1989, Shadow of the Beast was easily their biggest hit yet and would cement a strong relationship between the developer and publisher, leading to eight further titles including Destruction Derby. The success helped attract DMA Design (who would later become GTA developer Rockstar North), who developed Lemmings in 1991 – a title still well known today – with Psygnosis as the publisher. It was a runaway hit, finding itself ported onto every known platform and topping every chart, selling 55,000 copies on its release. In 1993, the company was acquired by Sony Electronic Publishing (now SCE) for a whopping $48 million ahead of the western release of the PS1 in Western markets. Considering how many at Sony still thought the platform was a bad idea, it was a hugely controversial move with many at the Japanese technology giant thinking it was a waste of money, and many in the UK games scene thinking Psygnosis had just locked themselves to a doomed product. But as we know now, the PS1 was a huge success, as were Psygnosis’ early PS1 titles WipEout, G-Police, and the Colony Wars series. Another benefit Psygnosis brought was convincing Sony to create development kits based on cheap PC hardware that were universally compatible, rather than the planned expensive, Japanese MIPS R4000-based machines that would be connected to a prototype PS-X box. The benefit this had on the PS1’s library cannot be overstated. Under Sony, Psygnosis opened studios in Stroud and London – which would later become Studio Camden and then SCE London – and Foster City in California – now home of SCEA. In 1999, Psygnosis publishing branch was merged into Sony Computer Entertainment Europe as a whole, and the Psygnosis name was changed to SCE Studio Liverpool. SCE Studio Liverpool’s first title was Formula One 2001 on PS2, and the developer released seven more installments in the racing franchise across PS2, PS3 and PSP, until SCE decided to not renew its exclusive license with the Formula One Group before the 2007 season. While they developed Formula One, they also continued their most successful internal Psygnosis franchise, WipEout, with WipEout Fusion, releasing in 2002 on PS2. Then came WipEout Pure for the PSP in 2005, seen by many as the series’ best game and one of the handhelds greatest games. This was followed by the 2007 sequel WipEout Pulse, which was later ported to the PS2 in Europe. 2008 saw the release of WipEout HD for the PS3’s PSN, taking Pure and Pulse courses and revamping them with gorgeous graphics that are still breathtaking. Expansion pack Wipeout HD Fury brought new game modes, new tracks, new music and new ship designs the year later. It has been decided that production on a number of projects within Studio Liverpool will cease immediately due to project prioritisation. Our North West Studio Group has been and will continue to be a vital cog in the WWS family, with a history of producing genre defining games such as MotorStorm, WipEout, Formula 1 and WRC and this decision will have no impact of the role that the North West Studio Group will play in the future of all PlayStation platforms. Liverpool continued despite the cuts, bringing out Vita prequel Wipeout 2048 earlier this year to positive reviews. Considering the Vita hasn’t sold terrifically so far, the game could only have sold a limited number. After release, the developer brought out DLC and then began focusing on their next project. According to Eurogamer, they had been developing a “dramatically different” WipEout game for the PS4 and a Splinter Cell-style game that used motion capture tech that was “a bit ahead of” L.A. Noire‘s. Sadly we’ll probably never see the games as today Sony announced the closure of the WWSE Team of Studio Liverpool. FQA, GFPQA, XDev, CSG-Video, Localisation services and WWSE Finance departments will remain, but the actual teams that make the games were shut down. As some of you may have heard Sony have chosen to close Studio Liverpool as of today. …We have loved making every game, every minute and every one of you. Keep the faith, keep loving WipEout. Thank you for everything, Pilots. It’s been an amazing journey and we’ll miss you.